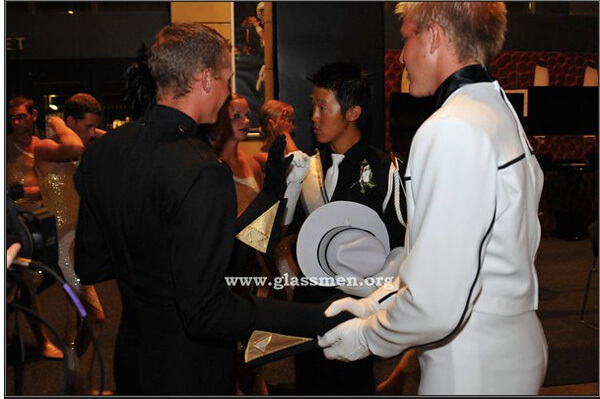 2010 Glassmen drum major Wyatt M. submitted this photo and caption. This photo was taken by one of our volunteers while we were backstage at Lucas Oil Stadium, waiting for retreat at the 2010 World Championship Finals. It shows myself, our other drum major Josh J., Zach A. one of the drum majors from Blue Stars, and conductor John L. of the Madison Scouts. Even though our corps were very competitive on the field, that never came into what we called the "drum major circle." I'm really glad to say that all of the drum majors and conductors we met this year were awesome people. And I stay in contact with many of them in the off-season.